Everyday cooking and trying to decide what to cook for dinner for the family can be extremely difficult at times. Trying to come up with a meal that won’t take too much effort, yet is going to satisfy every ones tastes is a common occurrence. 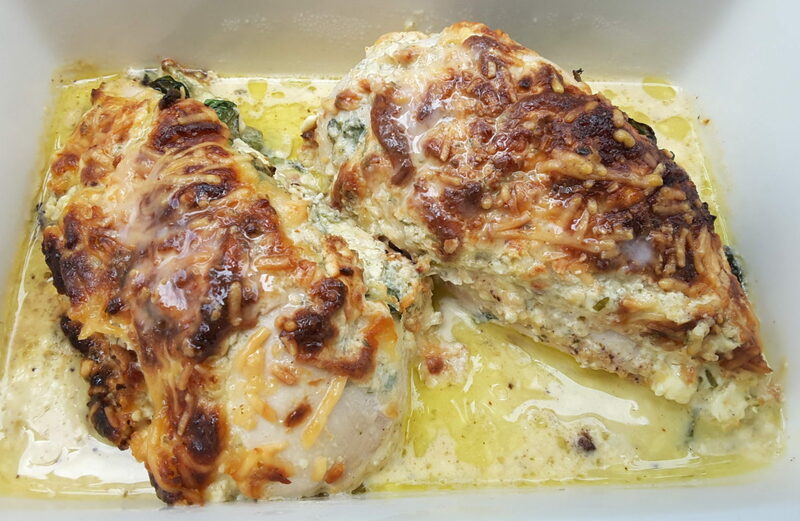 This wonderful recipe for Low Carb Creamy Chicken Spinach Bake is going to make your life a little more simple. This dish takes about 10 minutes to prepare and then just needs to be oven baked until they are cooked through, for about 25 minutes. Serve them with some simple sides such as green beans or broccoli, some cauliflower mash, or even a simple salad, and you have a lovely meal, that tastes fantastic. If there are only 2 of you, you could still make up the whole recipe and either freeze the leftovers, or serve them for another meal to make you life a little easier. You can add the spinach leaves (chopped) to the cheese mixture, instead of placing it in the pockets separately if you wish to. The reason I keep them separate is so that I can use some of cream cheese mixture to spread on top of the chicken, without any spinach in it. If you add the spinach to the cream cheese mixture, then you could also use thawed, drained frozen spinach. Make sure you check out some of the other simple to make meals on this blog, that are perfect for family meals and are also reasonably simple to make. There is a delicious recipe for a Slow Cooker Beef Stroganoff, and a lovely, simple to make recipe for Chilli Con Carne, all low carb of course. Don’t forget to also look at the recipes for Low Carb Eggplant Parmigiana, Low Carb Moussaka and Eggplant Lasagna as well. Preheat the oven to 180 C/ 360 F fan forced. Cut a pocket along the length of each chicken breast, for the filling to be placed into. Rub a little oil over the chicken breasts. on a cutting board and drizzle with olive. Season the breasts with salt and pepper. Mix the cream cheese, mayonnaise, Parmesan, garlic, parsley, salt and pepper together till combined. Place approximately 2 tablespoons of cream cheese mixture side each pocket and spread out evenly in the pocket. 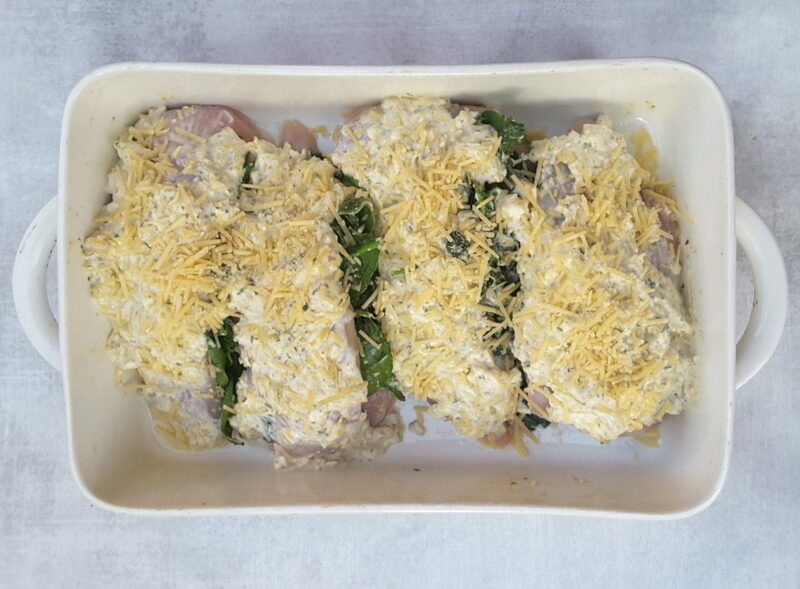 Divide the spinach leaves amongst the 4 fillets and place on them on top of the cream cheese mixture inside each chicken fillet. Press the top of the fillet down to compress slightly. 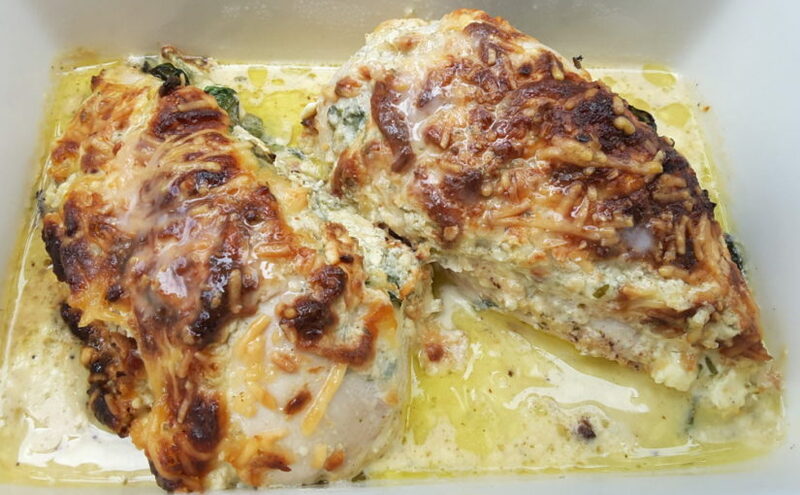 Place the chicken fillets into a 9” x 13” baking dish and top with the remaining cream cheese mixture, spreading it out on top of the chicken. Sprinkle the fillets with the grated mozzarella cheese. Bake uncovered in the oven for 25 to 35 minutes, or until the chicken is cooked through. Serve with your favorite side of vegetables, such as green beans or broccoli, or with a simple salad. Sour cream or yogurt can be switched for the mayonnaise. I made this recipe but didn’t have spinach. It still tasted great. I used spring onions in its place. Really nice recipe thanks.